Hank was born in 1926 and raised in Toledo, Ohio. His love of flying began at a very early age, seeking small jobs to pay for flying lessions at a local airport. At the age of 17, he attempted to enlist in the US Air Corps but was rejected because he was too young. He then enrolled and was accepted into the Royal Canadian Air Force. He returned to the US to gather his personal belongings and when he attempted to return to Canada, he was turned away at the border when his true age was discovered. We were neighbors of the Stambaughs on SO Locust and our children were friends. We send our prayers of concern & Good memories to all the family. Hank and Ruth were the best neighbors that one could wish for while living on Poplar Lane. Always willing to help, Hank and Ruth were invaluable in helping me take care of my aging parents at that time. My best regards and sympathies to Ruth and their children. My prayers and thoughts are with all the Stambaugh’s. I know many who will dearly miss you uncle Hank. Our condolensences are with the whole family and I wish you many thoughts of happy memories. Ruth and family, I am saddened to hear of Hank’s passing, but I know, and you, family, know, that Hank knew God, and knew that He had saved him literally on more than one occasion. I know that he is in a new place now with God, and I look forward to more stories with Hank when I again meet him there. I really loved Hank….he and I could converse about so much….Hank was fantastic. I married Ruth’s sister Eva’s daughter: Jayn (Wilson)….and enjoyed Ruth , you and Hank, coming to visit on occasion in NW Ohio to see your sister Eva and her family. Such a delightful gentleman was Hank, a truly good person. I shall never forget my conversation once with Hank, where I asked if he had ever, like some people say , as a pilot seen anything ‘strange’ while flying…and said he had ! and he told me the story of “the green object” that had buzzed him a few times while flying people to Hawaii or somesuch. His copilot confirmed. Great man, great artist, great pilot. good man, nice man, and a good man of God. So see you out there, Hank! God bless, to Hank and Ruth and all the family. As it happens, Ruth’s sister Eva’s granddaughter , Barbara’s daughter Emma, is to wed here this very Saturday here in NW Ohio, and so we are having people coming in and we shall be in good rememberance of our Hank! God bless all. Our prayers are with you Ruth and family. You are blessed. We were blessed knowing Hank. We look forward to again seeing him . Rick, husband of Jayn (Wilson), the daughter of Ruth’s sister Eva. Date 8/26/2014. Hank, you’re flying again! You have been a blessing in our lives. Thank you. 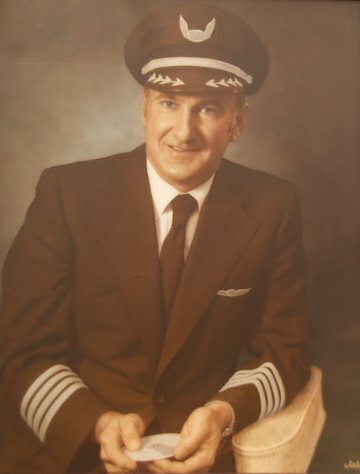 I first flew with Hank in 1962 while he was still a co-pilot on the DC 6 B later on as his CO-Pilot on the DC6B and the L-10ll .He had a great since of humor and a very good pilot ! We have three of his Bronze Sculptures The Marble Shouter, The Sandlotter Baseball Kid, A Sterling Dream To Fly. All Prized Possesions ! I enjoyed many years flying with Hank at Western Airlines on the DC-10 to Honolulu. Fond memories with a prince of a guy! Uncle Hank, we will miss you. Your easy smile, great sense of humor, and talent as a pilot is how we will remember you. You are finally home. Our condolences are with Aunt Ruth, Christy, Luke,and Jim. From Denise (Dale’s daughter) and Denny. The Stambaugh’s were our backyard neighbor for more than 20 years. My parents were friends and neighbors of Hank and Ruth for many years. Our heartfelt condolences to Ruth, Jim, Chris, Luke and the rest of the family. As a new pilot for Western I had the pleasure of flying second officer for Hank in Denver. He always took time to explain things and we enjoyed his stories.A true gentleman, superb aviator and a kind man….he will be remembered. Aunt Ruth, Jim, Chris, and Luke, and families, How saddened we were to hear the news of Hank’s passing. Uncle Hank and Aunt Ruth have always had a special place in both of our hearts. As the youngest son of Carl and Eva, ( Ruth’s sister ) I have many fond memories of trips they made to N.W. Ohio to visit the farm and family. I used to love to hear Hank’s stories about flying from the large jets to his crop dusting days, including one flight that didn’t go just exactly as planned! Truly then,as now, he had God as his co-pilot.I always appreciated the fact that Uncle Hank would tell it like it was: no sugar coating. Honest, straight to the point. The B.S. was for fertilizer in the farm fields! A man of integrity, a man of faith,a man’s man. How sad I am that I was to young to really appreciate all of that while it was happening. I think it was a Joni Mitchell song that said” Don’t it always seem to go,that you don’t know what you’ve got till it’s gone”, so sad, but so often true. Of all the many memories made, one stands out for Julie and I. Ruth and Hank had flown back to attend our wedding ( 26 years ago )which was very special for us.It worked out that Julie and I were heading to Steamboats Springs to ski for our honeymoon and that we flew back to Denver on the same flight as Ruth and Hank. Having never really flown before other than in a small plane, they were very comforting to us.After we were in flight,they came back to get us and took us up to the first class seats where they were at and somehow Uncle Hank made arrangements for us to ride there for a good part of the journey. He ordered a couple of beverages for us,which helped us relax more on the flight! Once we were in Denver, they graciously opened there home for us to stay for a couple of days before our ski trip started, and for a few days afterwards until our flight home was to leave. They helped us get our rental car,pointed out a few highlights in Denver to check out, ( the museum and Garden of the Gods were awesome! ), drove us to the Air Force academy,took us out for dinner, and basically pampered us while we were there.They treated us like we were Kings and Queens! They were a HUGE part of a very special honeymoon! What great Aunts and Uncles I’ve had put in my life as I grew up!!!! Unfortunately,the miles between us and everyday life has kept us from seeing each other for quite some time. Aunt Ruth, Jim, Chris, and Luke, our prayers are with you and your families at this time and always.We will all be together someday for a grand family reunion! Love and Respect always, Todd & Julie. I too know Hank from flying with him at Western Airlines. His smile and spirit were warm and tender and he was a reminder of what a Daddy should be, like my father too. His wife Ruth is just as caring,gentle, sweet and generous. We have one of Hanks masterpieces also, Depression Kid ‘Sandlotter’ 1938 which we have always cherished. Sorry to the Stambaugh family we will not be able to get to Denver tomorrow but you will be in our prayers. will have the peace in your heart that Hank is now enjoying. We know all of heaven welcomed him with open arms. We were long time neighbors of Hank and Ruth, having lived directly across the street from them on South Locust. When we moved into our house in the mid 60’s, Hank and Ruth were the first people to introduce themselves and welcome us to the neighborhood, and we became fast friends for many years. We will never forget Hank’s generosity in always giving of his time freely, his super sence of humor, and his creative abilities. Hank taught me the very essence of the construction business, welding, plumbing, electricity and carpentry, which I have passed on to our sons. We had many fun times with Hank and Ruth as neighbors, movie/dinner club outings, and trips to Las Vegas. Hank you will never be forgotten. We pass on our heartfelt condolences to you Ruth, Jim, Christy, Luke and families. We will carry all of you in our hearts. Hank was a true gentleman, a good person and an excellent pilot. . I loved flying with him because we always had a good time, he took care of his crew and kept us all safe. He will be missed by all who knew him. Our condolences to Hank’s family and friends. I offer my sincere condolences to Hank’s family and friends. May you watch down on me every day now!! You always let us know how much you loved us and was very proud and supportive. You made me very proud as well, and was honored to be one of your grand kids! You left us with all of us by your side and your wife if 66 years. I hope that I go the same way with Jonathan holding my hand in a standing room only room full of my kids and grand kids telling their fondest memories of me and telling me they love me. The day after you passed Colorado’s weather was over cast and cloudy, in the summer which doesn’t happen quite often and know that it is mourning its loss as well as, you made such an impact on so many people here. May you have one of your famous soft landings in heaven and rest in peace LOVE YOU SO MUCH PA!!! Ruth, Bill and I share in your loss of your daring Hank. We will always remember his birthday party when we gave him is personalized Coors Beer keg. God bless you and your family. Mrs. Stambaugh. I was very sorry to hear of Hank’s passing. I enjoyed many fun hours flying with Hank at Western and have nothing but fond memories of those times. Hank was always a pleasure to fly with and was one of my very favorite captains. My thoughts and prayers are with you and your family. Hank is a true friend, a true gentleman, a mans man, and a pilots pilot. His life on earth, will be noted with great love and distinction, by all who knew him or were fortunate enough to cross his path. May the Lord bless you all, with wonderful memories, and pleasant feelings toward this great man who loved much, gave much, and surely left this world a better place. I shall miss him greatly, but will always have fond memories of our “travels” together. We are now coming up on 2 weeks following Hank’s memorial service and 3 following his passing. I feel incredibly honored to have known Hank for the 17 years I have. I was so taken with Hank and Ruth when I first met them that I insisted that they meet my folks long before Luke did. They became fast friends and Hank and my father soon learned that they each owned the very same shirt. So as you may have guessed, this made selecting attire each time we got together was quite easy and very amusing for the rest of us. As many of you shared, Hank was an amazing story teller and never seemed to repeat the same flying stories…to me at least. He had that quiet proud way of speaking that captivated us… full of drama, satire and chuckles. I felt so very embraced by the Stambaugh family and adore Christy, Jim, Lynn and all of Luke’s nieces and nephews and babies. Ruth is a very special woman and it’s hard to imagine raising a family when your pilot/husband is away so frequently. Jim captured many of these moments so beautifully in his Eulogy for Hank and I suppose kids will be kids. This certainly raised Ruth’s status quite a bit! For those of you who could be present at the service, it was truly extraordinary. Pastor Dale offered his gentle and infinite guidance, Christy’s’, Jim’s and Luke’s vision carried out flawlessly, the presence of all 9 grandchildren sharing the important numbers in Hank’s life, the lei Heather brought with her from Hawaii playing such a touching role, Jim’s delivery of a most beautiful and memorable eulogy accompanied by so many rich photos, and the role that each of you played by simply being there in person and in spirit. To top it all off, we enjoyed welcomed fly-over after the service. Hank is till up there and I’m sure right alongside that pilot. Thank you to those who opened your homes and your hearts to our family and to all of you who will continue to be in Ruth’s life. You are loved.